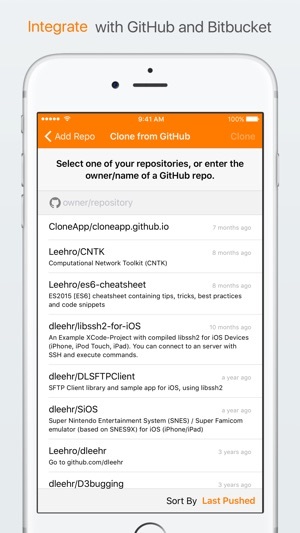 Clone brings the power of Git version control to iOS. With beautiful visualizations, an advanced code editor, intuitive Git workflows, and powerful integrations, Clone takes Git productivity mobile. A graph is worth a thousand SHAs. 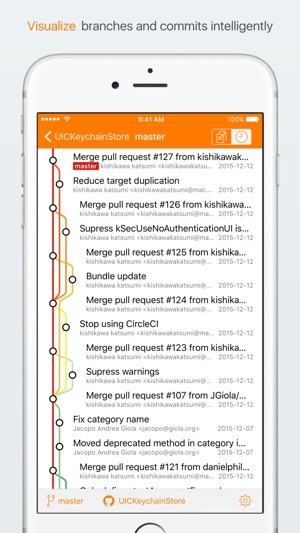 Clone shows commit history beautifully and quickly, so you can see what that merge commit actually merges. See what changed in amy commit with diff views. For individual files a heat map (blame) shows the who, what and when for each part of the file when you're asking why. On all devices, Clone supports the latest iOS technologies. Use Clone as a document provider to edit code directly in your favorite editor, including Swift Playgrounds on iPads running iOS 10. Comparing your changes is only a swipe away with the Today view extension, even when editing in another app. Be more productive with iPad multitasking. You can work side-by-side. 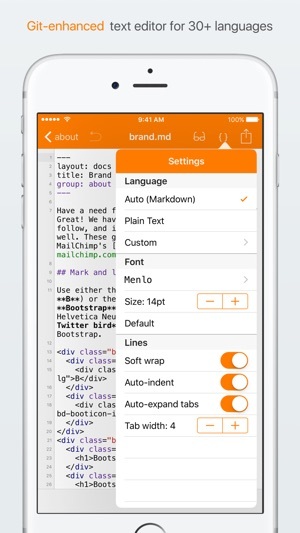 Write a blog post in Markdown from one app while previewing live in Clone. Commit and push are just a tap away too. Whatever the size, you're covered. Be fearless with version control. Clone's text editor previews HTML and Markdown. Write your blog next blog post from your device. Clone's editor performs syntax highlighting in 30+ languages and shows line numbers so you always know right where you are. Customize with 5 elegant code fonts, configurable sizes, soft tabs, and line wrapping. It's built around Git, so commit, blame, and revert are always at your fingertips. 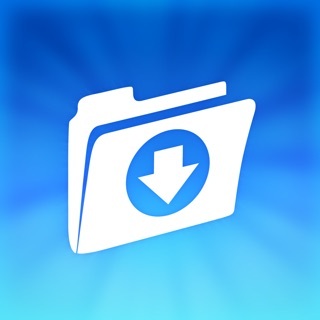 Pull, edit, commit, and push from any iOS device. 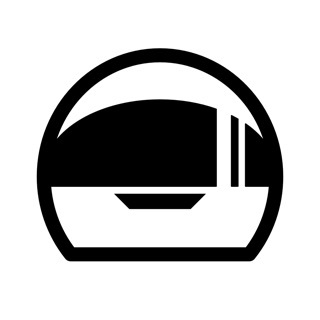 Connect your GitHub or Bitbucket account for instant access to your public and private repos. Use a public key for password-free authentication. View diffs before committing, ignore files, and be a Git master without a command-line. Does git push heroku master mean something to you? What about a gh-pages branch? 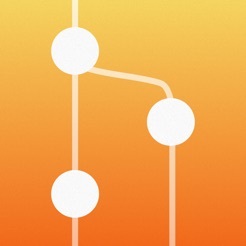 Clone can push your repos and communicate with multiple remotes. When merge conflicts happen, Clone helps there too. After connecting to your Github or Bitbucket account, you can clone your repos without typing a thing. 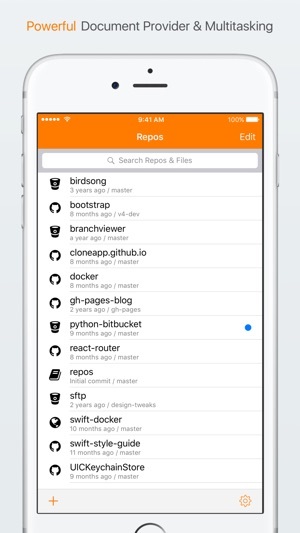 Repos you create on your device can be published to GitHub or bitbucket in seconds. Fix a bug, start a blog, or think bigger. It's great but there is a bug in the text Editor. When choosing a language for text highlighting in the custom menu, it does not highlight any words on the editor. The only way for the app to start highlighting words is when you press auto, but sometimes it automatically changes the programming language... Please fix this and I will give you guys five stars! I mainly use clone to keep up with changes when I'm away from my office and love it for that! Only feature I would like is to specify a name during clone (or rename once cloned). The name ends up matching the git repo from the clone URL and sometimes that is a non-project name such as "src" or "git"
Has the very basic features we need to access git repositories. It would be great to implement missing features brought up by other reviews, yet worth the 5-stars at its current condition.